Predicting how ecosystems will change as climate change progresses is a major challenge. A popular view is that species will move from warmer to cooler regions – towards the alps and poles – as global warming intensifies. We can think of this as the ‘President of the USA’ model, in which every newborn child has the potential to ‘lead the free world’. A theory that emphasizes potentiality over probability. The philosophy is great, but just as most of us have zip chance of becoming President, ecologists worry that many species have no chance of dispersing fast enough to keep up with a rapidly changing climate. Another curious aspect of this ‘waves of migration’ view is that it implies that species will respond to climate change in isolation. Thus, ten different species might all move uphill as the world gets warmer, without interacting with each other or with other species. But in nature, interactions rule. All populations are influenced by many factors other than climate, including other species and ecological disturbances. We get a different perspective on how global warming will affect natural ecosystems if we change our view point from the regional to the local. Picture a reserve that you know well, and imagine how the vegetation might change as global warming progresses. At this scale, we’re more likely to perceive changes as being much more chaotic. New species may appear and others may disappear for short or long periods. As one species declines another will become more abundant and take its place. At this scale, we’re unlikely to think about species moving independently in waves. Instead, we’re might view populations as being buffeted around like balls in a pinball machine, with numbers increasing and decreasing as each species responds to changes in the abundance of other species and changing disturbances. For example, a relatively rare species might increase in abundance – even if it is less suited to the new climate – if a dominant species declines and more resources become available for the rare species. As the vegetation and climate continue to change, disturbances such as fire regimes and insect herbivory may also change in unpredictable ways. Days of extreme fire danger are expected to become more common in south-east Australia. But this doesn’t necessarily mean that there will be more severe fires in the distant future. Fires don’t just need hot windy days, they also need dry fine fuels. As the climate changes, vegetation will change, which will alter fuel levels, which in turn will create new fire regimes. In some places, we may get more extreme fire weather, but less fuels to burn, as Ross Bradstock describes in a great review. Interactions among species, and between species and disturbance regimes, mean that we can’t just focus on one species at a time when we try to predict how ecosystems will change. We also need to understand how species interact, and how they affect each other. Many years ago, a prominent South African ecologist, William Bond, developed a theory to explain one of the biggest plant distribution patterns across the globe. Why are gymnosperms (conifers and cycads) abundant in some regions, and angiosperms (flowering plants) more abundant in others? Bond’s theory was based on differences in plant physiology between angiosperms and gymnosperms, and on interactions: interactions between species (gymnosperms versus angiosperms), and interactions between plants and disturbances, such as grazing and burning. The other Mr Bond enjoying a spot of field work. The ecologist is much less photogenic. 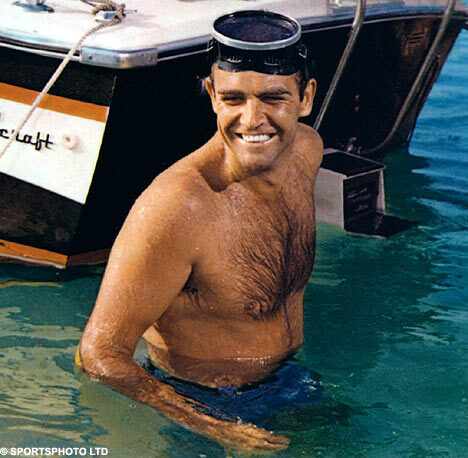 Bond noted that seedlings of most gymnosperm species grow more slowly than angiosperm seedlings. He argued that gymnosperms were most abundant in stressed, unproductive ecosystems, such as cold and dry regions, where they didn’t have to deal with competition from vigorously growing angiosperms. In productive ecosystems, Bond argued, competition from vigorous angiosperms would either kill gymnosperm seedlings directly, or would cause gymnosperm seedlings to be suppressed. Small, suppressed gymnosperm seedlings would then be vulnerable to disturbances such as grazing and burning. In some cases, gymnosperms would face further challenges if angiosperms promoted disturbances that were fatal to gymnosperm seedlings. For example, dense grasses promote frequent fires that will kill fire-sensitive gymnosperm seedlings. Bond’s model is known as the ‘slow seedling’ or the ‘tortoise and hare’ hypothesis. It has spawned papers with more imaginative titles, such as The Hare, The Tortoise and The Crocodile – in which tall ferns (aka the ‘crocodiles’) influence whether fast-growing angiosperms (‘hares’) win the race against slow-growing, tortoise-like, gymnosperms. Who said that scientists lose their child-like sense of imagination? Bond’s theory illustrates why we need to consider species interactions if we want to understand how climate change will affect plant distributions. According to this theory, the distribution and abundance of gymnosperms is influenced not just by climate, but also by soils, competition from angiosperms, and by disturbance regimes which themselves are influenced by angiosperms. This is the type of complex interaction between species and disturbance regimes that makes it so difficult to predict how global change will affect natural ecosystems. In 2003, during a severe drought, wildfires burnt over a million hectares in south-east Australia. One high intensity crown fire burnt over 10,000 hectares at Mt Pilot in north-east Victoria. As described in an earlier blog, Mt Pilot supports large stands of the native gymnosperm, Black Cypress-pine (Callitris endlicheri). Callitris stands are usually co-dominated by eucalypts (angiosperms) including Red Stringybark (Eucalyptus macrorhyncha), Long-leaved Box (E. goniocalyx) and Red Box (E. polyanthemos). The high intensity fire killed virtually all Callitris trees. After the fire, Callitris regenerated from seedlings and the eucalypts regenerated from seedlings and basal resprouts. We just published a paper in which we compared the regeneration patterns at Mt Pilot against Bond’s ‘tortoise and hare’ theory of interactions between gymnosperms and angiosperms. When I say ‘we’, I am not just indebted to my two co-authors, Heidi Zimmer and David Cheal, but to over 400 enthusiastic students who measured seedlings and coppice regeneration as part of a 3rd year undergraduate ecology subject from 2004 to 2011. What did we expect to see? Based on Bond’s theory, we thought that eucalypt (angiosperm) seedlings would grow faster than Callitris (gymnosperm) seedlings. We predicted that Callitris seedlings would grow more slowly, and would die more often, if they grew with lots of eucalypt seedlings, due to competition from the eucalypts. We also expected that small, slow-growing Callitris seedlings would suffer more damage by browsing animals which would lead to even more deaths. And, taking things one step further, we expected that fast-growing Callitris seedlings that grew in areas with few eucalypt seedlings would set seed cones earlier than slow growing seedlings in areas with many eucalypt seedlings. In short, we expected eucalypt seedlings would give Callitris seedlings a really hard time. By contrast, we thought that Callitris seedlings would have very little effect on the growth and survival of eucalypt seedlings. Dense eucalypt saplings above small Callitris seedlings, 6 years after the fire. This area was dominated by Callitris, not eucalypts, before the fire. Perhaps surprisingly (since, in my experience, good field data always complicates great theories), the patterns that the students recorded were really similar to our predictions from Bond’s theory. Eucalyptus seedlings did grow much faster than Callitris seedlings. In 2010, when they were 7 years old, the tallest eucalypt seedlings were 8 meters tall, whereas the tallest Callitris seedlings were just 3.5 meters tall. Callitris seedlings were eaten more often than eucalypt seedlings by animals, and Callitris seedlings grew taller in fenced plots that kept out browsing animals. Furthermore, Callitris seedlings grew faster and produced more seed cones where there were fewer eucalypt seedlings. For eucalypts, the opposite occurred; eucalypt seedlings actually grew faster, not slower, in plots that had more Callitris. All of which is entirely compatible with Bond’s theory. Tall Callitris seedlings in an open area. As an aside, I should point out that areas with dense eucalypt seedlings weren’t innately less suitable for Callitris, as many of these areas were dominated by tall Callitris before the fire. However, one important pattern didn’t turn out as we expected. Bond’s theory states that slow-growing gymnosperm seedlings should die off when faced with competition from vigorous angiosperms. However, hardly any Callitris seedlings died during the seven year period, whereas over half of the eucalypt seedlings died. Virtually all of the Callitris seedlings managed to survive, which is quite extraordinary, as many were browsed by wallabies and rabbits . 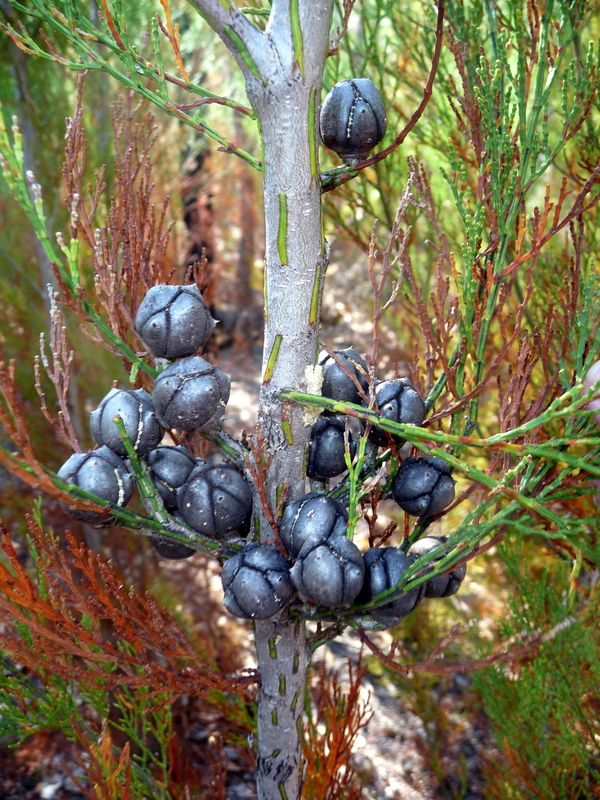 Seed cones on a tall Callitris sapling eight years after the fire. This surprisingly high survival rate may be because of an amazing quirk of Callitris ecology. Recent studies have found that Callitris species are among the most drought tolerant trees on earth. One consequence of this behaviour is that dense stands of regenerating Callitris self-thin very slowly. Instead, plants can persist in dense stands for many decades. In an unburnt area at Mt Pilot, 50 Callitris trees that are thought to be over 100 years old are packed together in an area of just ten by ten meters. This is a really high density of old trees. A single 100-year old tree growing in the open would occupy more space than this. 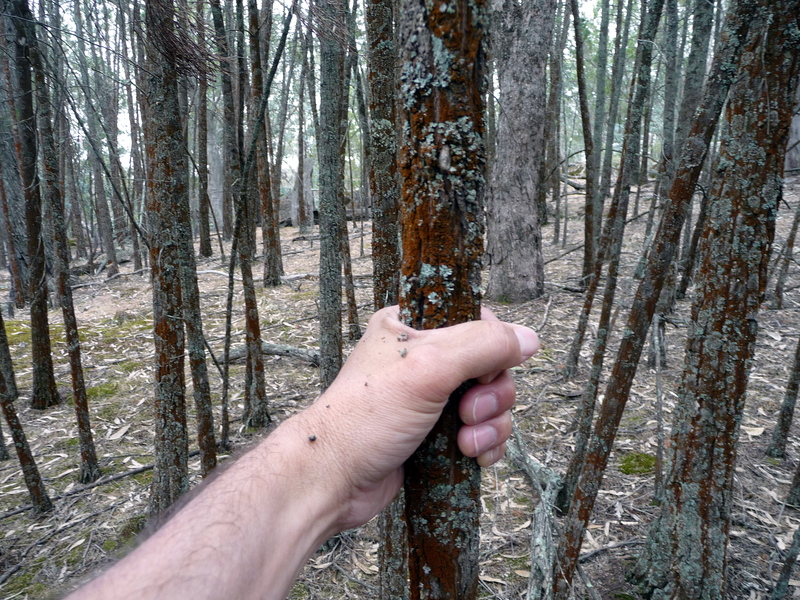 These old trees have grown extremely slowly, and some have trunks thinner than my wrist. 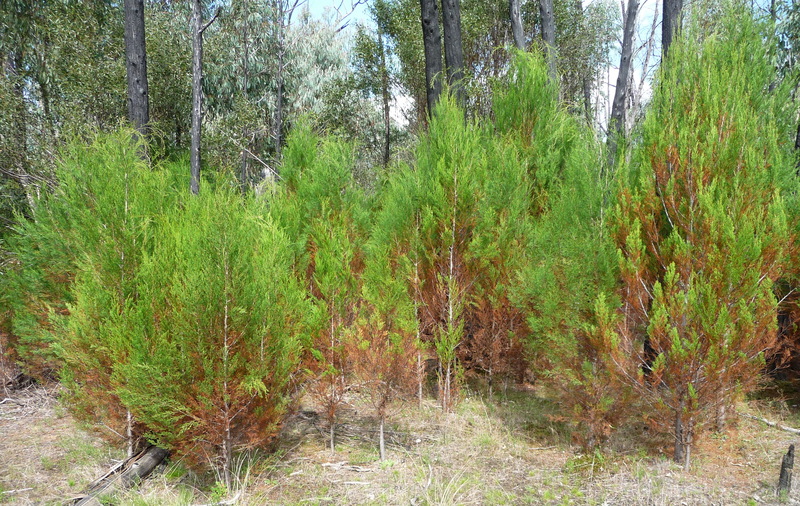 The outstanding ability of suppressed Callitris to persist in dense stands for lengthy periods may be an important factor that enables small Callitris seedlings to hang on beneath dense eucalypt saplings. It shall be fascinating to see what happens to these small seedlings in the future; will they slowly die out, or will the fairy tale ‘tortoises’ slowly overtake the fast-growing eucalypts? Suppressed old Callitris in an unburnt area. Growth rates can be very slow in dense stands. The fact that hardly any Callitris seedlings died in 7 years is surprising, but it doesn’t invalidate Bond’s model. Bond predicted that angiosperms would triumph over gymnosperms in productive ecosystems by two mechanisms. The first is by out-competing gymnosperm seedlings and causing them to die. This certainly didn’t happen at Mt Pilot. The second mechanism is by suppressing the growth of gymnosperm seedlings so that gymnosperms remain vulnerable to other threats, such as browsing and burning. And this does appear to happen. At Mt Pilot, the size of Callitris seedlings is influenced by how dense the eucalypt seedlings are. In areas with few eucalypt seedlings, Callitris seedlings grow relatively fast, and many of the tallest seedlings have already produced seed cones. By contrast, in areas with dense, tall eucalypt seedlings, Callitris seedlings are growing much more slowly, and none have produced seed cones yet. These small seedlings will remain highly susceptible to future fires. If the area remains undisturbed, then the fairy tale ‘tortoises’ have a chance of winning, or at least reaching a draw, in the race. But if the area is burnt by another high intensity fire in the near future, then the odds flip to the hares. And the more hares there are, the greater the odds turn in their favor. 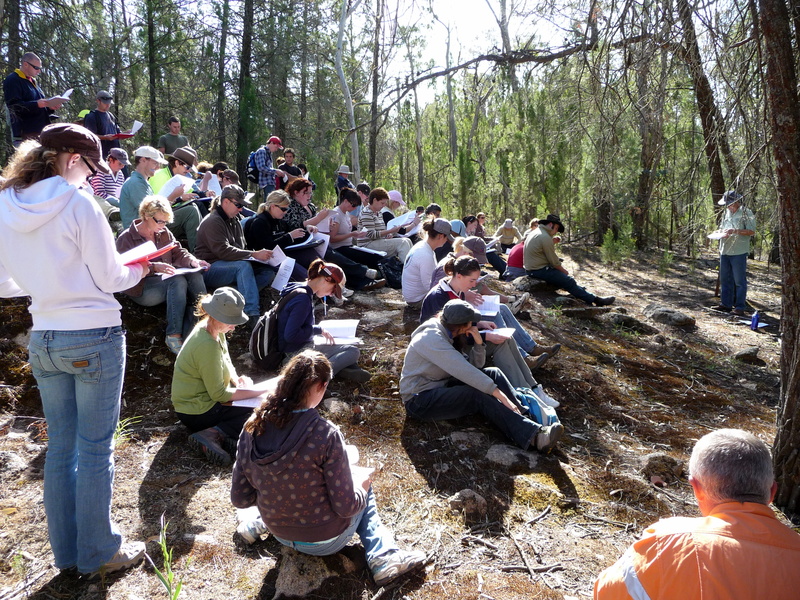 The students’ field work at Mt Pilot illustrates the value of long-term, repeated observations. Long-term observations don’t need to be complicated. Everyone can record how their local ecosystem changes over time using simple techniques, such as recording the date that flowers first bloom each spring and by taking repeat photographs from the same place. Long term observations will be immensely valuable to help us understand how climate change affects natural ecosystems. The study also illustrates how important it is to study interactions between species rather than focusing on single species in isolation. At Mt Pilot, long-term changes in the abundance of Callitris will be influenced by changes in climate, and by how climate change affects disturbance regimes, especially fire. But Callitris will also be influenced by other species, especially the dominant eucalypts, and by how these species also respond to climate change and future disturbances. Changes in the abundance of these two dominant trees will flow on to affect many more species of plants and animals. I won’t be around to see what Mt Pilot looks like when the effects of climate change really kick in. But with 400 students we’ve left a small legacy that will help others to better understand how species interactions contribute to the ecosystems of the future. Will the tortoises win? I won’t place any bets. We’ll watch and see. Bond WJ (1989). The tortoise and the hare: ecology of angiosperm dominance and gymnosperm persistence. Biological Journal of the Linnean Society 36, 227–249. Lunt ID, Zimmer HC & Cheal DC (2001). The tortoise and the hare? 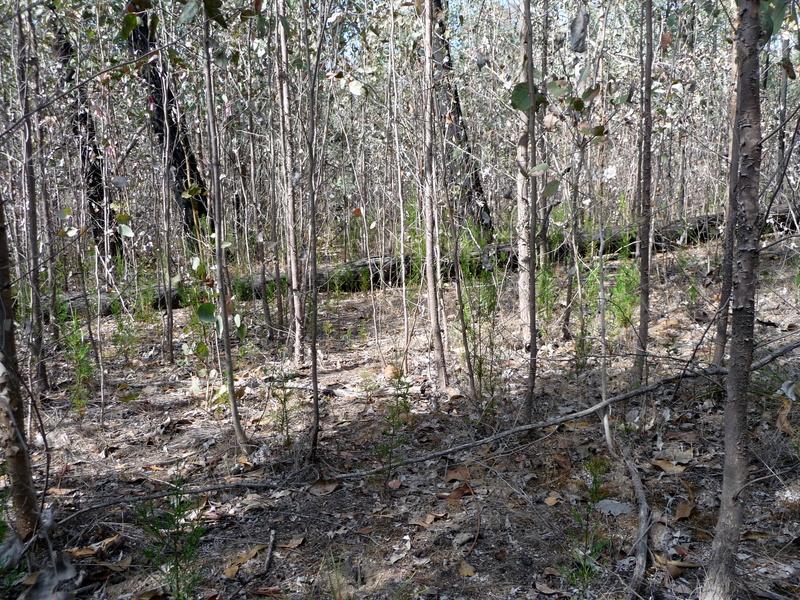 Post-fire regeneration in mixed Eucalyptus–Callitris forest. Australian Journal of Botany 59, 575–581. [This link is to an Open Access paper which can be downloaded for free].